DARPA's ACTUV program has designed, developed and constructed an entirely new class of ocean-going vessel, one intended to traverse thousands of kilometers over the open seas for months at a time, all without a single crew member aboard. "I'm on a ship that looks like a Klingon bird of prey," said Deputy Secretary of Defense Robert Work, as he stood on the deck of the robot vessel. At a ceremony last Thursday in Portland, Oregon, a constellation of senior Department of Defense, Navy and DARPA officials assembled to christen an unmanned anti-submarine warfare ship. 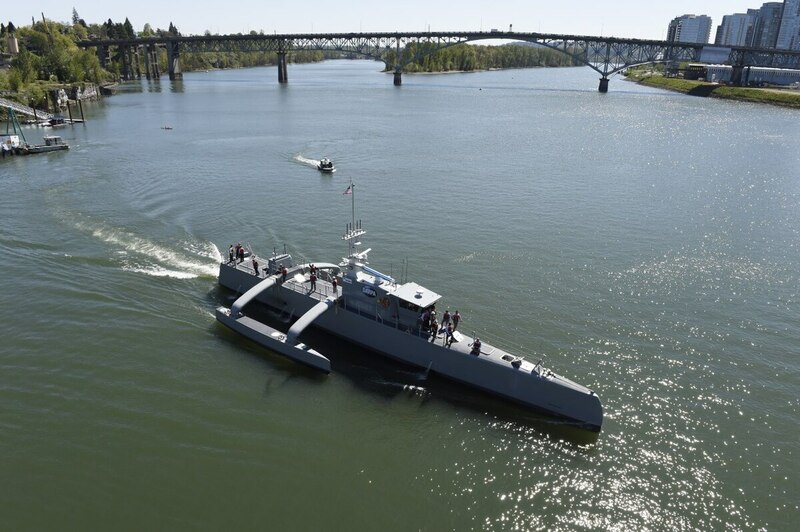 The DARPA vessel, christened the "Sea Hunter," is the first fruits of DARPA's Anti-Submarine Warfare Continuous Trail Unmanned Vessel (ACTUV) project. The goal is to develop a highly autonomous ship that can be trusted to basically sail itself to a particular patch of ocean. Equipped with a powerful active sonar, ACTUV can find diesel submarines, whose quiet engines make them hard to detect. Once a sub is detected, the 27-knot ACTUV -- or quite possibly a flotilla of ACTUVs -- would shadow the target while armed platforms, such as ships and aircraft, are called in to destroy it. What's it like to step aboard a robot warship? A media tour of Sea Hunter at the Portland dock revealed a Navy ship hat is familiar in some ways, such as the haze-gray paint and the ladders that are awkward to climb and descend. But while Sea Hunter is 132 feet long, it is only about 11 feet wide (an Arleigh Burke-class destroyer is 66 feet wide), creating a ship that feels inhumanly narrow. Then again, the hull can afford to be slender because there is no need to add crew quarters, galleys or the other necessities for flesh and blood; even the bridge on Sea Hunter, which contains a touchscreen for the ship's controls, is just a temporary convenience for the test engineers that can be removed once the ship goes to sea. The only air conditioning on ACTUV is in the C4N (command, control, communications, computers and navigation) compartment, the server farm that must be chilled to maintain the computers hosting the artificial intelligence (AI) that runs the ship. ACTUV has a displacement of 100 tons (145 tons fully loaded), a maximum speed of 27 knots, able to operate in Sea State 5 (8- to 13-foot waves) and designed to survive Sea State 7 (20- to 30-foot waves). The craft has a range of 9,000 nautical miles at a speed of 15 knots, 4,000 nautical miles at 18 knots, and 2,800 nautical miles at 24 knots. Sea Hunter was built by the Vigor Shipyards facility in Portland, though Leidos is the prime contractor for ACTUV. The next stop for Sea Hunter is San Diego, where it will undergo testing through 2018, though DARPA will hand the ACTUV program over to the Office of Naval Research in December. Pointing to a remarkable feature on a 132-foot-long robot warship is almost a tautology. But even in an era where unmanned vehicles have become pervasive, ACTUV is unusual in its sheer autonomy, as it must be to sail on 70-day missions, across thousands of miles of ocean, with little human intervention. "This vessel can go 10,000 miles at 12 knots," Work said. "That means the fleet commander can push a button, and it will arrive in Bahrain, about 8,300 nautical miles away, with 15 percent fuel margin." While Predator drones require the continual attention of a pilot and sensor operator, ACTUV will require little attention from a human operator (what a Leidos employee jokingly referred to as a "ship-sitter") who will be able to monitor multiple vessels from his control station. Even if ACTUV loses contact with its human operator, it can continue its sub-hunting mission. Such a sophisticated AI is more than a luxury. To sail the oceans, a ship must comply with the International Regulations for Preventing Collisions at Sea, or COLREGS, which means that ACTUV must be autonomously capable of avoiding collisions. While this somewhat resembles the sense-and-avoid technology being developed to enable unmanned aircraft to automatically swerve away from potential collisions, ACTUV's system is more sophisticated: the ship's software will determine, based on its two radar systems, whether it or the other ship is obligated under COLREGS to yield. In addition, DARPA is examining image recognition software for the ship's cameras, which would automatically analyze visual imagery to determine the size of the other vessel for COLREGS purposes. Each ACTUV costs about $20 million to build, and are designed for operating costs of $15,000 to $20,000 per day. This compares to $700,000 per day for a guided-missile destroyer, or $300,000 per day for an unmanned helicopter, according to Work. "That's five ships for $100 million or 50 for $1 billion," Work added. "You might be able to fit a six-pack or a four-pack of missiles of it. Now imagine 50 of these vessels distributed and operating together under the hands of a flotilla commander." Work painted a picture of naval warfare where robot surface ships do much, much more than ping subs with sonar. "Imagine anti-submarine warfare pickets. Imagine anti-submarine warfare wolfpacks. Imagine mine warfare flotillas, distributed surface warfare action groups, deception vessels, electronic warfare vessels." Despite ACTUV's robotic nature, Work emphasized that it should ultimately be treated like any other Navy ship. "If the Navy falls in the trap of thinking of these vessels as somehow different than the other haze-gray warships that send shivers down the spines of our enemies, they are going to make a damned big mistake."